We will be airing today with our host “Brother James Foxx” on his show “The Defender”. 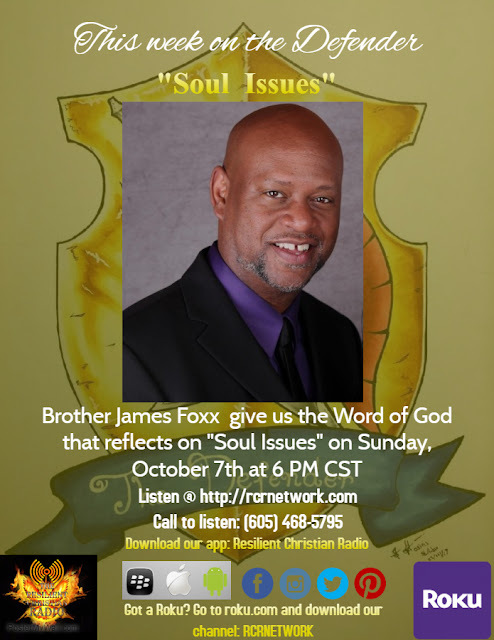 The topic for this week will be “Soul Issues”. So if you want to fight for the soul that it not be destroyed, and if you want to magnify the glory of God so that it not be belittled, and if you want to say yes to the weight and importance of God in this God-neglecting modern world, then see yourself as an exile from heaven and focus your desires on God so that your hope is in Him and not in this world, and the result will be an emerging beauty of behavior that conquers all slander and finally brings praise to God.